We studied a hydroxyapatite/zirconia-base bi-layer to encapsulate substrates of 316L stainless steel for covering orthopedic prostheses. The coatings were produced by screen printer and electrophoresis techniques to obtain coatings of about 41 μm for the hydroxyapatite layer and 11 μm for the zirconia-base layer. The system was characterized by X-ray diffraction, scanning electron microscopy, Raman scattering spectroscopy, FTIR Fourier transform infrared spectroscopy, and atomic force microscopy. The chemical reactions for obtaining ZrO2–base and hydroxyapatite layers are described considering thermodynamic calculations. It is observed that hydroxyapatite works like a stabilizer for the zirconia compound. Electrophoresis, Screen Printer Technique, Hydroxyapatite, Zirconia, Stainless Steel. In the year 2000 Health International and the United Nations Organization decided to declare the millennium’s first decade as “The joints and bone decade”, and to energise the scientific world to work against bone diseases . Along the centuries humans tried to care and maintain their bodies in good condition. But muscle-skeletal diseases are frequently caused by natural wear, osteoporosis, rheumatoid arthritis, traumas and congenital deformations. To combat these conditions, in many cases the orthopedist and the traumatologist decide on prosthesis use. The prosthesis is an implant used to substitute a damaged part of the body using surgical procedures . Prostheses are made of biocompatible materials, which can be metallic, ceramic, polymeric or composites. Biocompatibility is the property of some materials to be used as a replacement in the human body. Orthopedic prostheses are commonly made of 316L stainless steel and of some metallic alloys such as Cr-Co, materials are utilized mainly due to their relative low cost [2, 3]. With respect to the 316L stainless steel prosthesis, this material has similar rigidity to bone. Additionally, these alloys have high stiffness, non-magnetic properties and are corrosion resistant. But in physiological environment they degrade, which can result in poisoning, necrosis and cancer of the bones and other tissues, due to diffusion of ions and compounds towards the bloodstream . To improve the biocompatibility of metallic-orthopedic prostheses, they are covered with other materials with better properties, such as bioceramics coatings . For examples alumina and zirconia, which are inert ceramics, are used for covering metallic prostheses. The term inert is utilized for materials that in the body do not cause poisoning, so avoiding infections. Inside the body, these materials stimulate the production of tissues to cover and insulate the prosthesis. Alumina and zirconia can be inside the body for even for 7 and 10 years, respectively [5, 6]. To apply these ceramics as coatings on stainless steel substrates there are several physical and chemical techniques including laser ablation, plasma spraying, sol-gel, and electrophoresis . The main challenge for coating irregular shape prostheses is to produce uniform coatings . Some of the above techniques are expensive and usually require special conditions for deposition of coatings. But electrophoresis is a relatively inexpensive technique and it does not require special conditions for coating . It has been proved that this technique produces alumina and zirconia coatings with very high quality . By applying a second coating on the metallic prosthesis previously covered with a ceramic coating it is possible to reduce or avoid contact between the tissue and the prosthesis, if this new layer is a bioreactive material. Bioreactive materials have properties and composition similar to human bones. One bioreactive material is hydroxyapatite, which has composition and properties similar to bone. [3, 5]. Techniques used for producing hydroxyapatite coatings are chemical techniques like sol-gel, electrochemical deposition, and electrophoresis; and physical vapor deposition techniques including plasma spraying  and RF sputtering . Among the different chemical techniques, screen printing is used mainly for producing materials for the electronic industry, plastic art and textiles. This technique is also able to produce hydroxyapatite coatings . The production of coatings by this technique is called “technology of thick films” . Hydroxyapatite has a mineral structure similar to bone, and it is the ideal material to repair bone damage. In this work we developed a method to improve the biocompatibility of 316L stainless steel orthopedic prostheses by applying a hydroxyapatite-zirconia bi-layer system. The zirconia-base layer works like an inert coating, insulating the steel prosthesis from the body. The second layer is a hydroxyapatite coating which allows increasing osteo-integration between the body and the prosthesis. For producing zirconia and hydroxyapatite coatings we used, respectively, electrophoresis and screen printing techniques. In this paper we describe structural and microstructural studies on each coating and on the bi-layer system. The stainless steel was first grated with a SiC abrasive band of 180 CAMI (Coated Abrasive Manufacturers Institute) grit and then with SiC sand paper of 240, 320, 400 and 600 CAMI grit. This does not produce a mirror finish because it is necessary to create mechanical anchorage points for the coatings. The first, of zirconia-base, layer was deposited by the electrophoresis technique in an aqueous bath of 0.05 M ZrOCl2˙8H2O to, applying for 90 s a current density of 30 mA/cm2 to the stainless steel substrate. After this, the sample was dried in air at 100°C for 30 min. The second layer was a hydroxyapatite (HA, Ca10(PO4)6(OH)2) coating deposited by screen printing. The hydroxyapatite was obtained from a suspension consisting of hydroxyapatite powder dispersed in propylen glycol with the ratio 7:3, to obtain a 21000 cP viscosity. The HA coating was deposited using a nylon mesh of 120 threads/cm2, and then dried at 200°C for 10 min. to evaporate the propylen glycol. After deposition of the HA, the bi-layer/stainless steel sample was thermally treated at 650°C for 5 min. This treatment was performed in oder to improve the structure of both layers, working at the maxima of temperature and time allowable before the substrate begins to oxidize. The zirconia layer was analyzed by Raman scattering spectroscopy in a Labram II micro-Raman spectrometer, working with an integration time of 300 s. To obtain microscopic images and chemical composition, a scanning electron environment microscope (Phillips XL30ESEM model) with an energy dispersive X-ray spectroscopy accessory was used. Topographic images of the samples were also obtained in an atomic force microscope (model Nanoscope IV Dimension 3100, Digital Instruments of Veeco). Some samples were encapsulated in polyester to allow a transversal cut and subsequent analysis by scanning electron microscope. Infrared spectroscopy analyses of samples were performed in a FTIR Perkin-Elmer system, model Spectrum GX, working in the reflectance mode. For structure characterizations, an X-ray diffraction (DRX) system (Rigaku model DEMAX2100) was used. These measurements were performed working with a Cu-Kα1 line at 30 KV and 16 mA, and an incident angle of 2.5°, in the 2θ range from 10 to 80°. Due to the use of stainless steel as the substrate, there is a limit tothe allowable temperature for annealing the samples. Stainless steel begins degradation at a temperature of about 700°C. After several tests, it was found that the acceptable temperatures and times to avoid stainless steel degradation were 600, 650 and 700°C for 6, 5 and 3-4 min, respectively. Thus, zirconia-base layers deposited on stainless steel by electrophoresis were thermally annealed at 700 (4 min), 650 (5 min) and 600°C (6 min). In spite of the usual procedures for producing zirconia coatings, these coatings were not annealed at high temperatures. But the procedure was favorable, because a reactive surface appeared on the zirconia-base layer consisting of (OH-) radical groups, which improve chemically linking with the hydroxyapatite layer. A Raman scattering spectroscopic analysis performed at the zirconia-base layers allowed us to identify monoclinic and tetragonal phases of ZrO2. 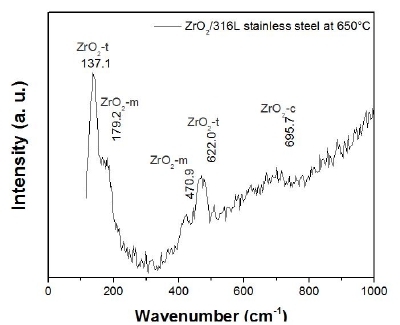 Figure 1 shows a Raman scattering spectrum of a zirconia- base layer on a stainless steel substrate treated at 650°C [14, 15], where several Raman scattering peaks of monoclinic and tetragonal zirconia phases are observed. EDS measurements carried out on these samples indicate Zr and O in the zirconia-base layer; and Fe, Ni, C and Cr ele ments in the stainless steel substrate. Figure 1. Raman scattering spectrum of a ZrO2/316L stainless steel sample showing tetragonal, monoclinic and cubic phases of zirconia. Zirconium hydroxide in the first layer allows improvement of the adherence of the hydroxyapatite layer, by means of chemical anchorage between (OH)- radicals of the Zr(OH)4 and (OH)– radicals of the hydroxyapatite, as will be explained bellow. Figure 2. Scanning electron microscopy image at 1000X showing the morphology of a zirconia layer. Some features due to polishing of stainless steel substrates are observed. 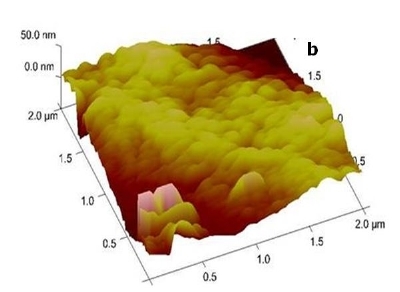 AFM images, Figure 3, show the surface topography of zirconia coatings, where is observed a nanostructured material with nanocrystalline sizes of about 200 nm. Figures 3.a and 3.b show the 2- and 3-dimensional images of a 2.0 x 2.0 µm2 region on the zirconia layer after thermal annealing at 650º C by 5 min. Figure 3. 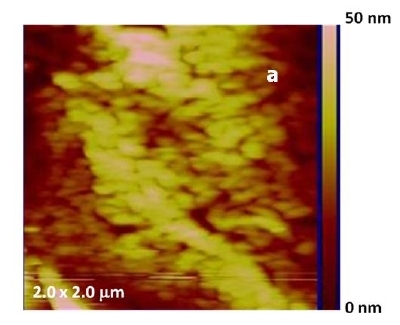 Atomic force microscopy images of a zirconia layer showing the nanostructured features, a) 2-dimensional, and b) 3-dimensional. An X-ray diffraction pattern of the hydroxyapatite layer is shown in Figure 4. This pattern shows several characteristic peaks of hydroxyapatite, which have a very good coincidence with the ASTM reference for hydroxyapatite . No signals from the stainless The EDS spectra show characteristic peaks of calcium, phosphorus and oxygen elements, which are components of the hydroxyapatite. Some peaks corresponding to silicon and magnesium are also observed. These latter elements are characteristic of commercial HA powders (Alfa Aesar), but they are not unfavorable because they exist in blood and body . Figure 4. X ray diffraction pattern of a hydroxyapatite layer with peak identification according with an ASTM reference. 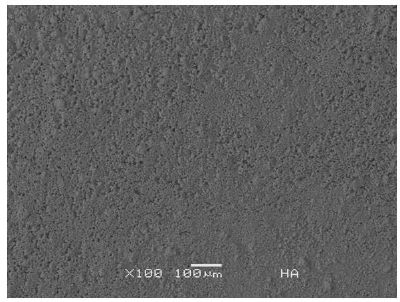 The hydroxyapatite coating images (Figure 5) obtained with secondary electrons using a JEOL electron microscope show a typical porous and rough surface. Porosity is a very important property of the prosthesis, as it accelerates bone growth and regeneration. The structural configuration of the hydroxyapatite includes porosity with characteristic pore size and morphology. Pores are critical for osteo-integration of the prosthesis and allow the growing of bone and the transfer of minerals needed by the bone-tissue . The general pore size in bone is in the range 100 to 400 µm. However, there are also some fine porous structures with size in the range 5 to 20 µm, which allow retention of the osteoblasts cells and the commencement of osteointegration . Osteoblasts are mononucleate cells that are responsible for bone formation. 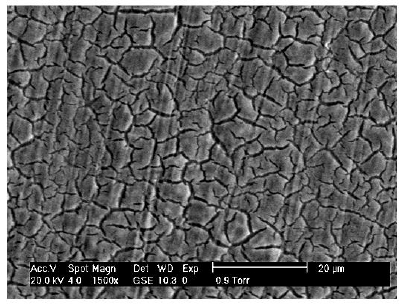 The pore size range of the HA/zirconia-base coatings can be observed in the micrograph (Figure 5) as from 5 to 25 µm. This hydroxyapatite porosity allows starting osteointegration to commence, and so it is possible to avoid infections and to reduce the resorption time of the bone substitutes . The hydroxyapatite coatings produced by screen printing show porous and compact structures after thermal treatment. Figure 5. SEM images of hydroxyapatite layer where its natural porosity is observed. 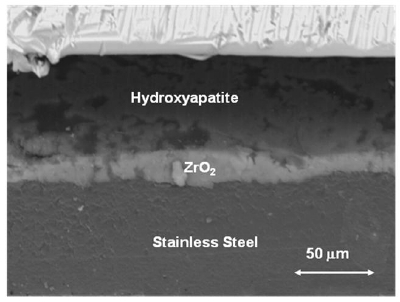 A transverse image of the HA/ZrO2/316L stainless steel system shows the various layers (Figure 6). This SEM image was obtained with backscattered electrons, at high vacuum, and using a gold coating. From this image it is possible to obtain approximate values of thickness for each layer: thus the zirconia thickness is about 11 μm and for the hydroxyapatite layer it is 41 μm. Figure 6. SEM images of cross section of a HA/ZrO2/316L stainless steel system. As it was mentioned previously, the zirconia layer is not sintered, so that it has a chemically reactive surface, beyond the roughness of the stainless steel substrates. These characteristics allow a chemical and mechanical link, to so obtain very good adherence between the hydroxyapatite and ZrO2/316L stainless steel (Figure 7) [17, 21]. This bond between HA and zirconia is supported by (OH)- radical groups. After thermal annealing of the samples, some calcium phosphates appear in the HA/zirconia-base coating interface. The origin of calcium phosphates in the HA/zirconia-base coating interface is related to the existence of (OH)- radical groups on the un-sintered zirconia-base layer, which are responsible for linking between the hydroxyapatite and zirconia-base layers. After thermal annealing, (OH)- radical groups evaporate by decomposition of the HA to form octa-calcium phosphate (OCP, Ca8(HPO4)2(PO4)4) and di-calcium phosphate (DCP, CaHPO4) in the layer’s interface. Hydroxyapatite has a hexagonal crystalline structure consisting of tetrahedral and octahedral sites. While OCP has a monoclinic structure with the same octahedral sites as HA structure, DCP has a structure with tetrahedral sites forming a monoclinic structure . Some authors maintain that calcium phosphates like OCP and DCP are precursors of osseous hydroxyapatite when they are in contact with physiologic serum . These phosphates were observed by infrared spectroscopy (IR) after the hydroxyapatite layer was mechanically removed. 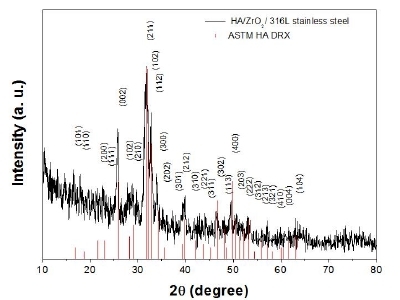 Figure 8 shows IR spectra with some differences between the hydroxyapatite layer, and the residual layer of OCP and DCP on the zirconia layer (Figure 8). Figure 7. Bonding mechanism in the system HA/ZrO2/316L stainless steel. Figure 8. Infrared spectra showing differences among HA and OCP and DCP layers. A bi-layer HA/ZrO2 system of was successfully deposited on stainless 316L steel substrates by electrophoresis and screen printer techniques. This bi-layer system has chemical and structural characteristics to become a very good candidate for biocompatible coating of orthopedic implamt prostheses. Future studies on this bi-layer will include biomechanical, biological, and corrosion tests. Authors a acknowledge the invaluable help of Martín Adelaido Hernández, José Eleazar Urbina, Lourdes Mondragón, Francisco Rodríguez-Melgarejo and Reyna Araceli Mauricio-Ortiz for characterization of samples, and to Hector D. Orozco- Hernández for preparation of the ZrO2/stainless steel substrates. Special acknowledgement to María Teresita Santoyo-Arreguín, Hugo Díaz-Hierro, Virgilio A. Gonzalez- Martínez and Fernando Sanguino for their collaboration. 1. P. M. Brooks, “Musculoskeletal Medicine: the Challenge of the Bone and Joint Decade”, APLAR J.l Rheumatol., 7 (2004) 272-277. 2. J. C. de la Fuente and G. Meza Reyes, “Prótesis Maravillosas; A tu salud”, Rev. Med. Prev. IMSS, 4 (2004) 72-75. 3. R. Schmidt, “Werlestoffverhalten in Biologisschen Systemen”, Springer, Berlin, (1994) pp. 281-295. 4. J. B. Park and J. D. Bronzino, “Biomaterials Principles and Applications 2003”, CRC Press, (2003) pp. 20-25. 5. L. L. Hench, “Bioceramics”, J. Amer. Ceram. Soc., 81 (1998) 1705–1728. 6. C. Piconni and G. Maccauro, ”Zirconia as A Biomaterial”, Biomaterials, 20 (1999) 1-25. 7. O. van der Biest, S. Put, G. Anné and J. Vleugels, “Electrophoretic Deposition for Coatings and Free Standing Objects. Electrophoretic Deposition: Fundamentals and Applications”, J. Mater. Sci., 39 (2004) 779-785. 8. G. Anné, K. Vanmeensel, J. Vleugels and O. Van der Biest, “A Mathematical Description of the kinetics of Electrophoretic Deposition Process for Al2O3- Based Suspension”, J. Am. Ceram. Soc., 88 (2005) 2036–2039. 9. M. Wei, J. Roys, M. V. Swain, B. K. Mithorpe and C. C. Sorrell, “Hydroxyapatite-coating Metals: Interfacial Reactions During Sintering”, J. Mater. Sci., 16 (2005) 101-106. 10. 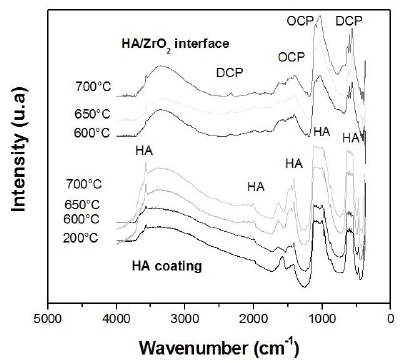 W. Chen, Y. Liu, H. S.Courtney, M. Bettenga, C. M. Agrawal and J. L. Ong, “In Vitro Anti-bacterial and Biological Properties of Magnetron Co-sputtering Silver-hydroxyapatite Coating”, Biomaterials, 27 (2006) 5512-5517. 11. B. Bermúdez-Reyes, F. J. Espinoza-Beltrán and J. Muñoz-Saldaña, “Recubrimiento de Hidroxiapatita/ Sílice-alúmina/ Acero Mediante Serigrafía/ Sol-gel Para Prótesis”, XXIII Congreso Internacional de Ingeniería Mecánica. Morelia Mich., Mexico (2005), pp 243-248. 12. D. E. Reimer, “Analytical Engineering Model of Screen Printing Process: Part I”, Solid State Technol., 31 (1988) 107-111. 13. M. Mathew and S. Takagi, “Structures of Biological Minerals in Dental Research”, J. Res. Natl. Inst. Stand. Technol., 106 (2001) 1035-1044. 14. M. Li, Zhaochi Feng, Guang Xiong, Pinliang Ying Xin and Can Li, “Phase Transformation in the Surface Region of Zirconia Detected by UV Raman Spectroscopy”, J. Phys. Chem. B, 105 (2001) 8107-8111. 15. D. A. Zyuzin, S. V. Cherepanova, E. M. Moroz, E. B. Burgina, V. A. Sadykov, V. G. Kostrovskii and V. A. Matyshak, “X-ray, Raman, and FTIRS Studies of the Microstuctural Evolution of Zirconia Particles Caused by the Thermal Treatment”, J. Solid State Chem., 179 (2006) 2965-2971. 16. S. Koutsopoulos, “Synthesis and Characterization of Hydroxyapatite Crystals: a Review Study on the Analytical Methods”, Wiley Periodicals, Inc. (2002), pp 600-612. 17. B. D. Ratner, A. S. Hoffman, F. J. Schben and E. Jack Lemons, “Biomaterials Science”, Second Edition, Elsevier Academic Press, U.S.A. (2004), pp 60-67. 18. L. A. Cyster, D. M. Grant, S. M. Howdle, F. R. A. J. Rose, D. J. Irvine, D. Freeman, C. A. Scotchford and K. M. Shakessheff, “The Influence of Dispersant Concentration on the Pore Morphology of Hydroxyapatite Ceramics for Bone Tissue Engineering”, Biomaterials, 26 (2005) 697-702. 19. F. C. Gomes de Sousa and J. R. G. Evans, “Sintered Hydroxyapatite Latticework for Bone Substitute”, J. Am. Ceram. Soc., 86 (2003) 517-19. 20. M.-C. von Doerhberg, B. von Recherberg, M. Bohner, S. Grünenfelder, G. Harrg van Lenthe, R. Müller, B. Gasser, R. Mathys, G. Baroud and J. Auer, “In Vivo Behavior of Calcium Phosphate Scaffold with Four Different Pore Sizes“, Biomaterials, 27 (2006) 5186-5198. 21. W. Bonfield, M. Wang and K. E. Tanner, “Interfaces in Analogue Biomaterials“, Acta Mater., 46 (1998) 2509-2518. 22. X. Lu and Y. Leng, “Theoretical Analysis of Calcium Phosphate Precipitation in Simulated Body Fluid”, Biomaterials, 26 (2005) 1097-1108. Edificio U, Ciudad Universitaria. Av. Francisco J. Mújica s/n, Colonia Felicitas del Río. C. P. 58000. Morelia, Mich.
Unidad Querétaro. Libramiento Norponiente 2000, Fracc. This paper was also published in “Advances in Technology of Materials and Materials Processing Journal, 9 (2007) 141-148”.